You are currently browsing the tag archive for the ‘Pa negre’ tag. My recap of April’s Film Fest DC (belatedly) continues with the more serious films. Films that intend to have meaning, explore themes, and/or push outside the usual boundaries of cinema. Some succeed very well. Some succeed at being boring. Since my colleagues don’t like films where films don’t go boom frequently or deign to move at a pace slower than “breakneck,”* I will identify the Grouch that would hate each film the most. I think if someone made Another Year for a wider audience and set it in Zurich, the result would be Julia’s Disappearance, a wonderfully thoughtful and amusing film about aging and youth. Six stories intersect in one Swiss night. The titular Julia rides the bus to meet her friends at a restaurant for a dinner celebrating her 50th birthday. A gentleman her age catches her eye, but his eyes instead wander to a young woman in a revealing dress. An older woman next to Julia quips that at some age women become invisible. While that older woman goes to her friend’s 80th birthday party at a retirement home, Julia bails on her friends and strikes up a flirtatious conversation with a German businessman at a bar. Meanwhile, her three sets of friends bicker and make sly observations about getting old as they wait for the guest of honor to arrive. Finally, some teenage girls on the initial bus decide to steal some sneakers for a boy they like. Julia’s Disappearance doesn’t have the level of authenticity of Another Year, but that’s because it’s played more for laughs. The conversations are full of snappy dialogue. It does feel like movie dialogue that real people wouldn’t say, but who cares when it’s so humorous and insightful. Of the four major story threads, the one among the waiting friends in the restaurant is the best. A married couple, a gay couple with a sizable difference in age, and a bachelor growing forgetful in middle age spend their time ragging on each other and other patrons who are chasing youth through a doctor’s scalpel. Grouch who’d like it the least: Adam. Too talky. This movie is the cinematic equivalent to claptrap. The director was in attendance at my screening and a Q&A followed. Audience members kept asking questions about various themes they picked up in the film and each question astounded me further. “You saw that??? The whole thing’s nonsense!” is what a more confident John would have yelled. The synopsis provided an interesting premise: an author afflicted with writer’s block is haunted by his previous characters who want him to continue their stories. That could have made for a clever story indeed. It also only lasts one scene. 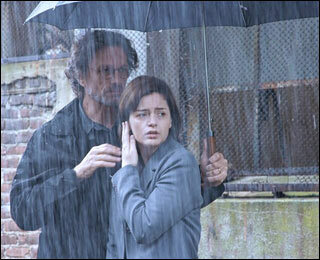 The rest of the film follows the author as he embarks on an affair with a crazy woman. And that’s really all there is to it. There’s no good reason for their attraction as best I can tell. He likes that she’s young, cute, and will sleep with him. She likes him because… she’s crazy? I don’t know. She has some manic and depressive episodes, he frets, the end. Grouch Who’d Like it the Least: Brian, who’d probably be most offended at how unimportant it all is. I have a sneaking suspicion Jared wouldn’t even hate it all, given that it’s somewhat of a romcom with a version of a manic pixie dream girl. I was having second thoughts walking into this. It seemed unlikely that this drama about human trafficking wouldn’t turn into a manipulative mess. But boy was I wrong. It’s an entirely effective film that earns its emotion. Malia is kidnapped from her south Sudanese village as a girl and pressed into service at a rich family’s home in Khartoum. Later she is shipped to another family in London. As she grows up a servant, her father travels through the country looking for her. The greatest service of this film is addressing the tricky “whys” of human trafficking: why doesn’t she run away? Why doesn’t she fight back? The physical restraints are somewhat minimal. It’s the psychological torture that prevents Malia from doing anything. Her masters tell her that she is worthless, that no one outside will help her, that they will kill her family if she leaves. From our perspective as western viewers, we know these threats to be baseless. To a girl yanked away from the Sudanese countryside at the age of 12, the threats are her prison. She runs away once in London, just to come back. I hope viewers will understand this from Malia’s point of view and not grouse about why she didn’t just leave. Grouch Who’d Like it the Least: Adam. All this anti-slavery talk is just leftist mumbo jumbo. If she didn’t want to be a slave she should have learned a marketable skill. I’ve learned that “comedy” doesn’t always mean what I think it means when it comes to French films and film festivals. That didn’t bode well for The Names of Love, billed as a “witty and politically pointed romp of a romantic comedy.” And it gets worse: one of its significant themes is what it means to be French in modern France. And yet, would you believe me when I say it’s delightful? And very funny? It’s populated by zany characters, none of which are realistic but all are entertaining. At the center is the unlikely love connection between Arthur, an awkward government scientist, and the free-spirited Bahia, an avowed leftist who sleeps with conservatives to convert them to her cause. They bicker and fall for each other and, while it’s not totally believable, it’s sweet enough. If Pan’s Labyrinth has taught us anything, it’s that the cruel era after the Spanish Civil War was a time with a lot of… surrealism. And if you’re in the mood for some supernatural Fascist barbarism, give Pan’s a look instead. In a small Catalonian town, the young Andreu has his life upended when his father must flee the authorities and he goes to live with his grandmother and extended family. 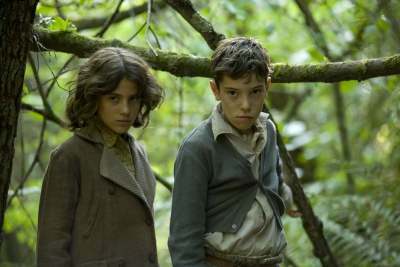 The plot revolves around a search for a spirit who may have killed the man Andreu’s father is accused of murdering. There’s a convoluted conspiracy involving some powerful Fascists and various other troubling things Franco’s thugs pull off. Grouch Who’d Like it the Least: Jared. Boring. I think Brian would at least get something out of the history and Adam would appreciate that some lefties get killed real good. *Their retort would surely be that I’m a snob. But they are dumbheads. So there.